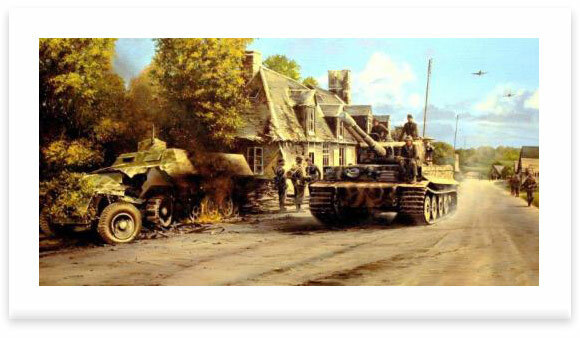 The latest release from the studio of military artist Richard Taylor is truly outstanding and is surely one of his best paintings to date. called up in 1941 he joined the 22nd Panzer Division as a tank crew member serving in the Crimea during the winter of 1941, the first of many tank battles including the battle of Stalingrad. After evading capture in 1944 he joined a panzer Division in the west, defending the Rhine against Patton’s US 3rd Army. A veteran of the German Normandy campaign he served as a Paratrooper providing ground support for various Armoured Panzer Divisions including Tiger Tank units. Joining the German Army in 1943 he trained as a tank crewman and transferred to the 12th Waffen SS Panzer Division in Belgium in 1944. Staying with this elite unit in France during the Allied Invasion he fought throughout the Normandy campaign, on D-Day, at Falaise and was eventually taken PoW. Beautiful, highly-detailed and individually hand-crafted, Richard Taylor’s pencil remarques are not only a joy to behold, but highly collectible as well. Two Remarque editions will be issued with HOLDING THE LINE. The first, limited to 25 copies, will each have an ORIGINAL pencil remarque; the second, restricted to just TEN COPIES, will be issued with a DOUBLE SIZE pencil remarque, measuring approximately 10” wide.